I created this frame using the Artsy image from Scribbles Designs, you can find it HERE. I hope one day to have an actual scrap studio instead of one wall in my bedroom. I could get SO much more done if I actually had a room dedicated to creating. ...sigh.......hopefully one day. And on that day, this frame will be the first thing I decorate with!! 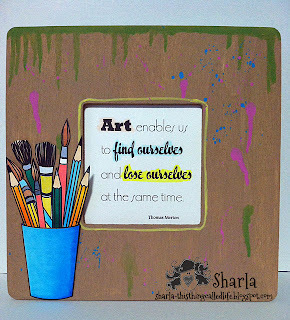 This is way cool Sharla! I love it! Fabulous altered frame; love the sentiment! Thank you for playing along with us at Altered Eclectics October Challenge.